This morning, M&M’s released its full 30-second Super Bowl ad online. As revealed in a 15-second teaser ad released online on Jan. 23, the full Super Bowl ad (below) stars Danny DeVito. In the ad, to be aired during the game’s first quarter, animated spokescandy “Red” finds a lucky penny, and makes a wish: To become a human being, so that he will stop being pursued by people trying to eat him. 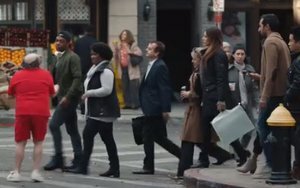 Magically transformed into a human in the form of DeVito, Red verifies with passers-by — including YouTube star Todrick Hall, in a cameo (above) — that they don’t feel the urge to eat him. Then his luck runs out. M&M’s, which often has social influencers share its branded content, decided to surprise its fans by flipping its approach to include the cameo by Hall, said brand director Allison Miazga-Bedrick. The brand’s 15-second teaser video will be aired once on TV, during the Super Bowl pre-game show on NBC. M&M’s will also show the Super Bowl ad in conjunction with a Twitter-activated vending machine exhibit on February 3, at the Super Bowl Experience at the Minneapolis Convention Center. Cars on several of the city’s Metro trains will be wrapped with M&M’s-branded promotions leading up to the game.